These messages display when you try to access a record that is already open or was closed abruptly and improperly. Network problems or dropped connections. Someone not properly exiting the software after opening the record (for example killing the task via task manager). The record is open on your workstation and is minimized or hidden behind an active window. Make sure the folio or reservation is not already open on your workstation or another workstation. It could be minimized so look in the computer's taskbar. It could be "hidden" behind another active window. If it was open on your workstation or someone else's, close it on both workstations and then try again . If you're positive that the folio or reservation isn't open anywhere else, you can override the message and access the record. To do this, you type the override password into the box and click OK. The default password is X but it could be anything. 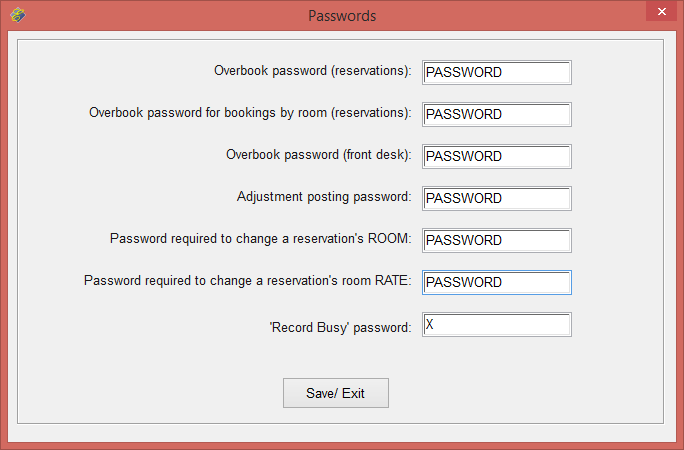 Management can verify the password from the Parameter Record Passwords window. If the record really is open more than once, only the last set of changes will be saved. If you bypass the message and change the guest name and comments, and then the other workstation saves their record, your changes will be overwritten. Do not override the message unless you are positive the record is not already open. Otherwise you will lose data.